Many firms have re-evaluated their fees; many have lowered them. The economic climate has coerced many firms in the A/E industry to re-evaluate their fees. For many, all-out survival is taking precedence over growth and profits. Despite discouraging statistics, many A/E firm leaders report the recession has encouraged tighter business practices, which should help long-term success. A recent survey by ZweigWhite  a publishing, education and management consultant to the design and construction industry  shows a slowdown in billing rate increases, an upswing in the number of firms decreasing or lowering fees, and a corresponding lack of growth and profits. The Fee & Billing Survey takes an in-depth look at the fee structures and billing practices of U.S. architecture, engineering, planning and environmental consulting firms across the U.S.
After experiencing years of steady increases, billing rates for top professionals have mostly dropped. In 2010, in just a single year, the number of firms discounting project fees increased from 65 percent to 75 percent. Most of those were, and still are, made on a case-by-case basis either by lowering billing rates, discounting the final price, or discounting reimbursables. More firms cite the recession as a motivator for clients to ask for, and get, this discount of 27 percent compared to just 8 percent in 2009. Firms are feeling it necessary to lower fees in order to stay competitive with the rest of the market. In 2011, 70 percent of firms report lowering project fees (73 percent of those who lowered fees did so on a case-by-case basis; 37 percent said they did this because of the recession). Clients are also taking advantage of a known desperation for work, and 19 percent of firms surveyed lowered fees at the client’s request. The potential expectation for fee reduction has caused many firms to tighten up contracts and billing procedures. The 2011 survey indicated that firms begin 5 percent of their contracts without a signed contract. A decade ago, firms reported beginning a median of 20 percent of their jobs without a signed contract, and a quarter of firms were beginning work on at least half of their jobs without a signed contract. Winning the work, doing the work, and ultimately getting paid for that work is the goal, she says. A/E firms derive their fees on a number of factors. The 2011 Fee & Billing survey revealed that 79 percent of firms have standard billing rates for each position or status level. Staff members’ time is often charged by the hour under “time and materials” contracts, and even with lump-sum or fixed-price contract jobs, firms may measure profit/loss by charging time against the project at billing rates. As expenses increase and economic factors change, many firms update their billing rates to keep up with market conditions. The 2011 survey revealed 79 percent update their billing rates annually. Billing rates vary greatly by job title and firm type. In most cases, billing rates are still increasing, just at a slower rate. Overall, the 2011 survey reported billing rates have increased a median of 5 percent over the past three years. The 2010 survey also reported a 5 percent increase. The 2006 survey reported a significantly larger median increase of 12 percent over the previous three years. Upper management and those with technology-specific jobs appear to have received the worst of the cuts. Associates have seen a reduction in billing rates. In the 2006 survey, the median hourly billing rate for associates was $126, though this jumped to $140 in 2010, it was reduced to $125 in 2011. Senior associates (those with more than five years of experience) had a median billing rate of $145 an hour in 2006. This decreased to $140 in 2010, but increased to $150 in 2011. 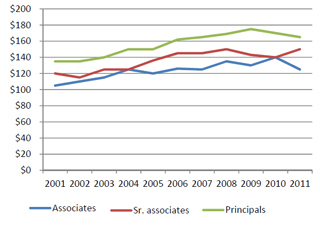 Principals’ billing rates have remained largely steady at $162 an hour in 2006, $170 in 2010 and $165 in 2011. For comparison purposes, these rates all increased $20 an hour or more between 2001 and 2006. No person, animal, plant or business will grow without some kind of fuel. Without fees that allow firms to make a profit, the percentage of firms claiming growth has drastically dropped off. For 2011, over the preceding three years, 16 percent of the firms surveyed enjoyed very high profits. Another 21 percent earned high profits, 35 percent experienced average profits and 25 percent earned low profits or had a loss. In 2010, 22 percent had very high profits, 24 percent earned high profits, 26 percent were average and 27 percent had low profits or a loss. In 2006, 25 percent had very high profits, 27 percent earned high profits, 31 percent reported average profits, and only 13 percent reported a loss over the previous three years. Billing rates increase more in growing firms than they do in those which are stable or declining. Less than half of firms (43 percent) reported they were growing; 58 percent were stable or declining. In 2010, these numbers were 47 percent and 52 percent, respectively. In 2006, 82 percent of firms reported they were growing and only a meager 17 percent said they were stable or declining. Firms concentrating on one particular market sector are reportedly battling it out with the competition, and often the lowest bid gets the job, but there are methods to combat this trend. Brad Mallory, CEO of Michael Baker Corp., an engineering consulting firm with over 100 offices located across the U.S. and world, said fees at his firm are not really up or down over the past five years. Christina Zweig writes for Structural Engineer Magazine, CE News and TheZweigLetter (ZweigWhite’s weekly management publication for the architecture, engineering, planning, and environmental consulting industry). She is based in ZweigWhite’s Fayetteville, Ark., office. ZweigWhite has other offices in Chicago, Durham, N.C., and Natick, Mass. Is your LEED project a green hornet’s nest?